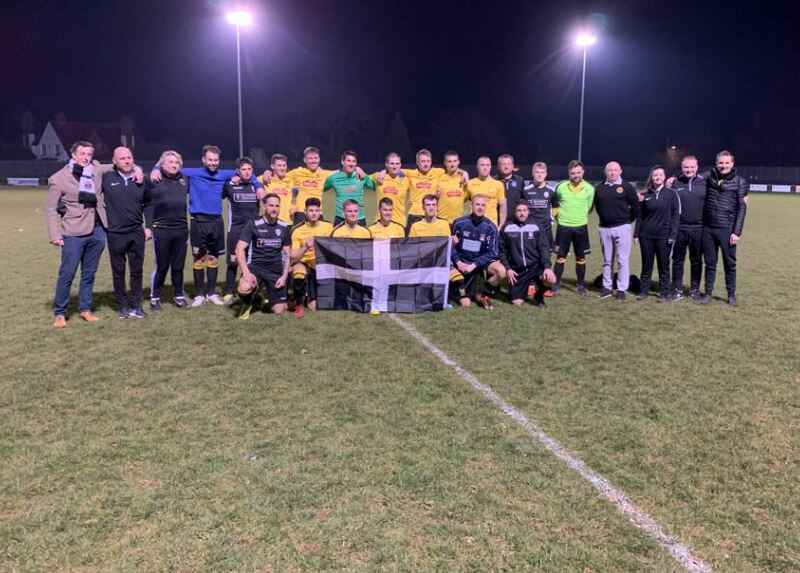 Kernow Football Alliance made history as they played their first game in a friendly against Foxhole Stars XI running out 3-2 winners on the night. Kernow FA, formed of players from the South West Peninsula League, took the lead in the first half when Harry Clarke was played through and finished well to write his name in Kernow’s history books. Kernow went on to extend their lead through an Olly Brokenshire penalty before making it three with Liam Eddy finding the net. Foxhole though were not here to be turned over and mounted a comeback that ran Kernow close when Dan Jennings and Harry Downing. Kernow FA though managed to hold on and completed the victory on a historic night for Cornish football. A crowd of 186 visited Poltair Park with many turning up to find out more about Kernow FA and the journey they’re about to embark on which could see them reach the CONIFA World Cup. CONIFA is the football governing body for non-FIFA affiliated nations and Kernow have become the newsest member joining teams such as Northern Cyprus, Jersey and Greenland.